It is snowing hard, a snowstorm warning is in effect and by the time it is done, there will be more than 9 inches on the ground. For the last couple of years I have been growing banana peppers in the garden. It was by accident really. I had picked up a bunch of pepper plants and these were part of them. Once they started growing bigger, I was excited. The potential of mirchi bhajji was on the horizon. But I had to be patient, to let them grow. 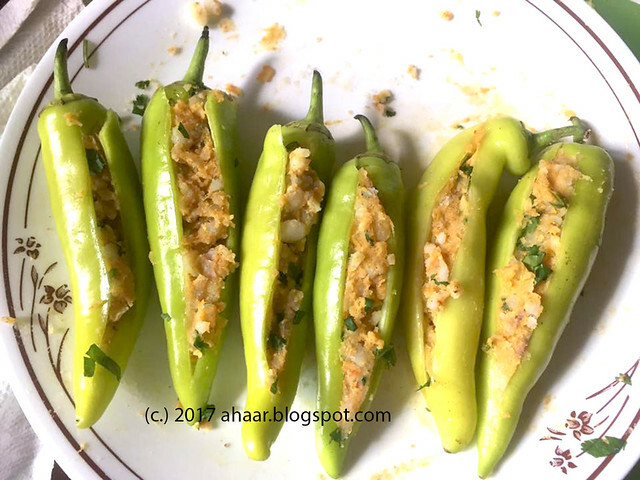 And soon, it was ready, I had a few fresh, plump banana peppers ready for mirchi bhajji. 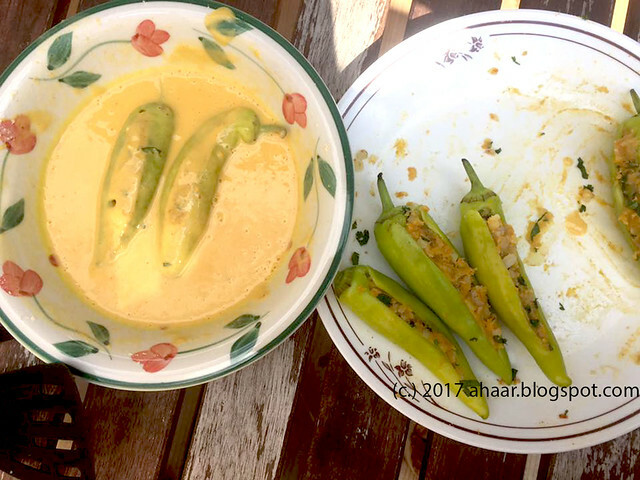 When I was in Jaipur, my mama would bring piping hot mirchi bhajjis and we would eat it hot making the shh sound when one eats something spicy and hot. These banana peppers are not super spicy, but don't underestimate them. They pack a punch in these bhajjis. I made a potato stuffing, but I can imagine several different kinds of fillings. 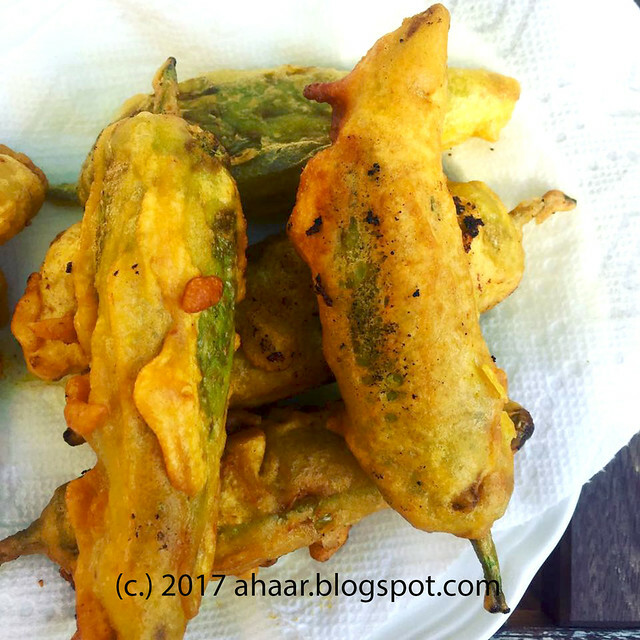 I would love to hear how you make or like your mirchi bhajjis or vadas. The first step is to clean the peppers. Slit them in the middle and then take out the veins and the seeds. If you want more heat, save some of the seeds to add to the potatoes. Take the boiled potatoes and mash them with your hands. Add in the spices and mix it together. Now take each pepper and stuff it with the potato mix. Run a hand over the peppers to take any extra away once the peppers are filled. Make the chickpea flour batter. Add the spices to chickpea flour and then add in water, little bit at a time till you get a thick pancake batter consistency. Heat oil in a wok, while the oil heats up, dip the peppers in the chickpea flour batter. Once the oil is hot, fry the battered mirchis 3-4 minutes on each side till they turn deep golden. Take them out and serve hot with chutney.